The Great Parental Adventure continued with a four day stint in Munich, chock full of adventures. We got into the city in the afternoon. Famished from a long journey, dad leapt at the first food vendor he saw, directly outside the Hauptbahnhof. He got a wurst there which was seemingly ordinary, but apparently it was one of the most delicious things he had ever eaten. Based on that first impression, we knew Munich was going to be a good time. The Neues Rathaus in Munich. After getting settled into our hotel, we immediately set off for Marienplatz, the heart of Munich’s old city. Our specific target was the fabled Hofbräuhaus. After some early missteps, we were able to find our way into the city center. From the first sight of St. Peter’s Church (Alter Peter), I was in love. There is so much beautiful and incredible architecture in Munich as well as history. To me, Marienplatz was totally overwhelming because it seemed like everywhere you turned there was something to see or explore or look at appreciatively. The Neues Rathaus is particularly stunning. 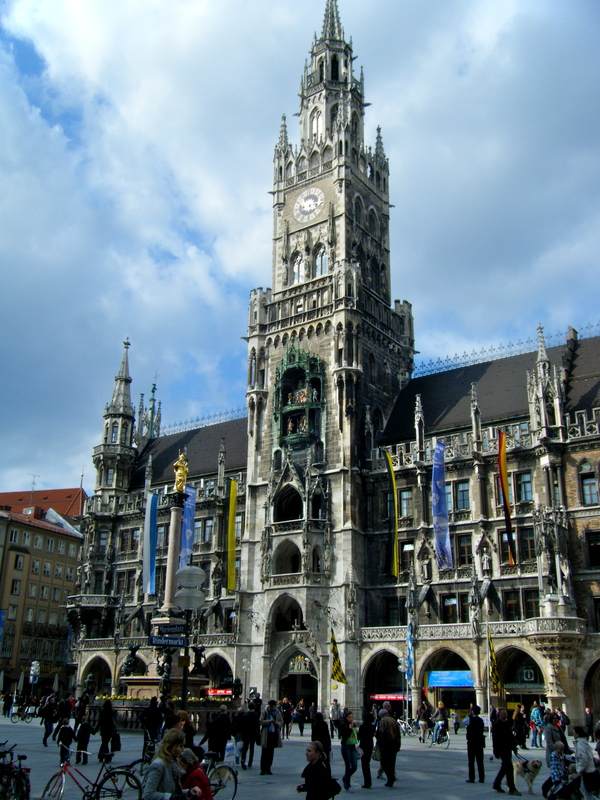 It’s most well-known for its Glockenspiel (one of Europe’s most overrated tourist attractions!) but to me, that was just a footnote. The building itself is just beautiful and so intricate, full of charming details that reward careful observers. No touristy visit to Munich would be complete without a visit to the Hofbräuhaus, so we made sure that was one of the first things we did. We’re thorough like that. But the Hofbräuhaus is a must-see for obvious reasons. Yes, it’s crawling with tourists and saturated with Bavarian stereotypes. But you know what? It’s also ridiculously fun. The atmosphere is convivial, the music is entertaining and, most importantly, the beer is delicious. The next day, we took a train out to Dachau in order to see the concentration camp memorial there. I was very conflicted about this trip. Obviously, this is a place that is powerful and worth seeing. But it’s still not an easy thing to commit yourself to, no matter how important you think it is. Still, I am glad I went. The camp is very well-preserved and extremely interesting and moving to visit. It was much, much bigger than I expected – walking into the camp and immediately seeing the open square where the prisoners used to line up for roll call was a somewhat surreal experience. I am quite glad that I got to visit the camp in April, instead of the summer when there might be more tourists. It was already a little too crowded for my tastes, and this was on a Wednesday in the low season. I experience places like Dachau better when there is more solitude, and it was quite distracting—and a little disheartening—for there to be so many tourists there who only seemed to want to take pictures, rather than take a second to internalize what they’re looking at. 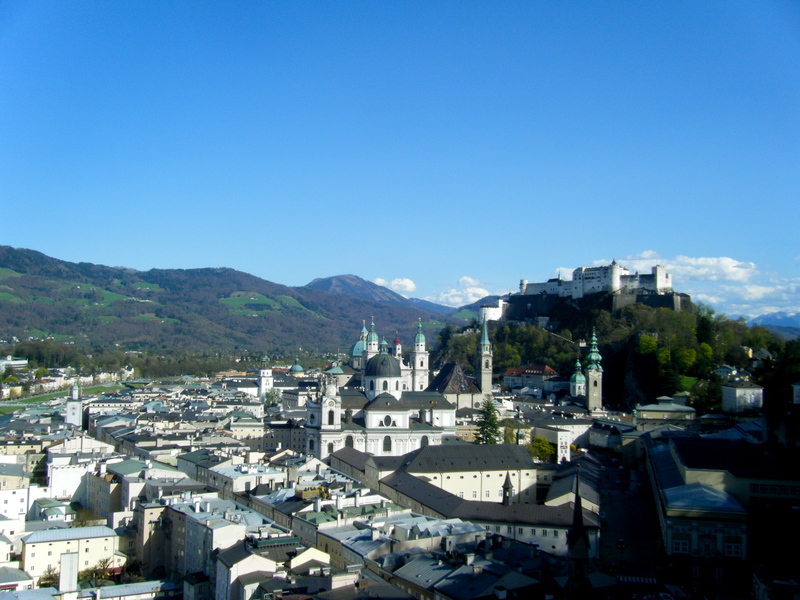 The third day, we took a day trip to Salzburg, Austria. I was excited for this both to see the city—I had heard it was beautiful—as well as to actually leave Germany for the first time. Granted, going to Salzburg was not exactly a huge departure from what I knew in Germany, but still. It was a new country! Overlooking Salzburg, with a glimpse of the Alps to the right of the fortress. The weather was phenomenal and Salzburg certainly lived up to its reputation as a beautiful city. A friend described the city as “excruciatingly beautiful” and by the end of the day, I think I understood what he meant. It was all just almost too perfect—a historic fortress looking down at the city from a hill, winding streets through a thriving old city, wide squares with picturesque fountains and white marble buildings… seriously, Salzburg pretty much has everything you could ever want in an ideal European city. We paid several euros in order to take an elevator up to the top of a hill so as to get a better look at the city, and I think that was definitely money well spent. It was a great vista from which to appreciate the beautiful white-and-green motif that dominates the city as well as to get a look at the Alps in the distance. To sum it up, Salzburg is simply gorgeous. The original plan for our last day in Munich was to go to Neuschwanstein, which is basically THE German castle to visit. However, it was clear that energy levels in the group were dwindling and none of us were particularly enthused by the two-hour train ride that would be needed to get us to the city of Füssen, from where we could obtain transport to the castle. We decided instead to use Friday to see more of Munich, and filling the day was not difficult – again, there is so much to see in Munich. We started with a tour of the Residenz, the former palace of Bavaria’s royal family. It was an interesting tour, but I’m not sure it was worth the money to me—it was just a lot of elegant rooms, many of which were reconstructions, since much of the Residenz was destroyed in World War II. The part I enjoyed most was actually seeing the display of the valuables that belonged to the family,, such as swords, crowns and gem stones. This was actually a separate part of the museum that you could pay individually for, and I think I would have been just as contented if we had only paid for the treasury portion of the museum. After the Residenz, we wandered over to the Viktualienmarkt to find some food. The Viktualienmarkt is basically a huge outdoor market where you can buy ready-to-eat food as well as things like vegetables, breads, etc. From there we went over to the beautiful St. Peter’s Church, which was largely destroyed in World War II and was then reconstructed in the aftermath. I’ve really come to appreciate the devastation that actually ensued from WWII. We don’t really have any conception of this in the United States because there has never been any sort of assault on our soil that has caused such widespread devastation. Yet time and time again, I visit places—structures as well as entire towns—that were something completely different before the war. I can’t help but wonder what Germany would look like if WWII had never happened—so much history was lost amidst the onslaught. 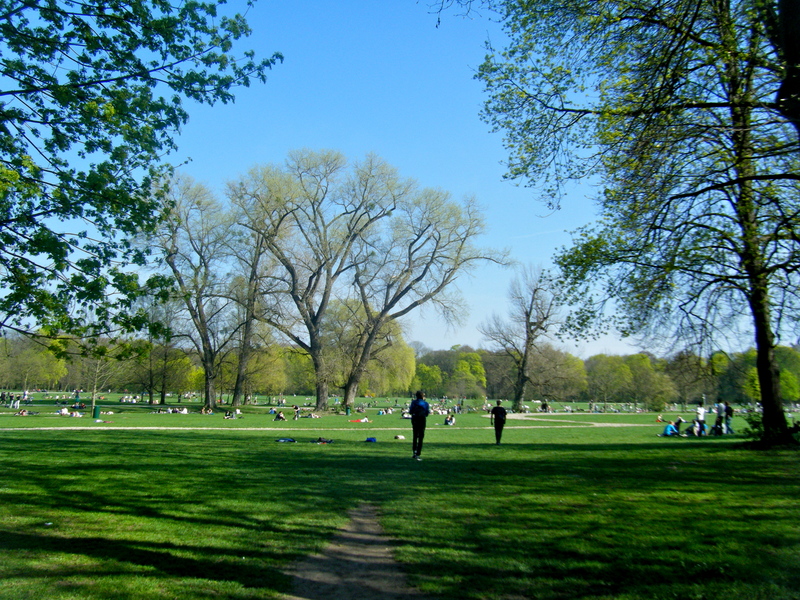 Our last stop was the English Gardens, a massive public park similar to Central Park in New York. The park space is absolutely massive from what we could see, and we really only saw a sliver. The University of Munich is situated along one edge of the park, which I think would be absolutely wonderful if you were a student. I was instantly jealous, suddenly no longer satisfied with grilling on the banks of the Lahn River in Marburg. All in all, I absolutely loved Munich. It’s everything you expect it to be, but it does that so well. If you can get over the fact that it’s crawling with tourists and accept its clichéd charm, you’ll have a blast. And seriously, the beer is awesome.